Turquoise cheetah print in two jungle style prints! There is a 1.5" chocolate brown grosgrain bow on the bottom, layered with two strips of a 3/8" satin turquoise cheetah print ribbons. 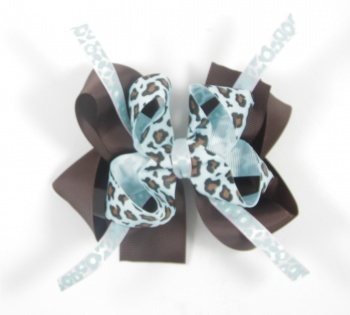 The top bow is a 7/8" turquoise ribbon with brown and black cheetah spots. Attached to a French clip and ready for all your JUNGLE travels!